Mirrors are versatile and provide various ways to brighten up a space and reflect your style and the beauty of your home. A large mirror in a small room creates an illusion of depth, making the room seem much bigger. Mounting mirrors in such a manner widens the space giving your design a better flow when navigating from room to room. We can help you reflect the beauty of your home! At Classic Glass & Mirror, we specialize in custom mirror products made to fit your design. No design is too big of a challenge for Classic Glass & Mirror. We fabricate each one of our mirrors to fit the room and positions of lights and electrical outlets, so you never have to sacrifice the beauty of your design. We offer different types of mirror including clear, coloured and antique in various sizes and shapes. We also specialize in beveling to give your mirror an added look of elegance. When you buy from Classic Glass & Mirror, we will help you make the best decision to suit your home by providing suggestions and alternative solutions. We will then cut, polish, bevel, fabricate and custom fit your mirror based on your specific needs. Visit our showroom today to see our wide selection of frames to give your mirror that added touch. 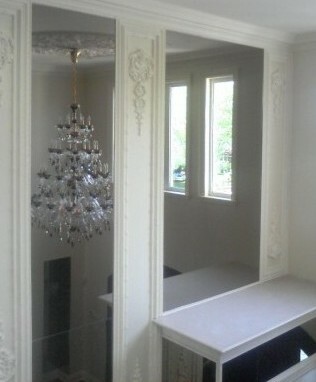 Once your mirror is manufactured and fabricated, have us install it for you! Our installed mirror products are backed with a 1 year service warranty and a 3 year manufacturer warranty. We want you to be just as happy with your product as we are with your business!